Most people understand that seat belts save lives. In fact, the Centers for Disease Control and Prevention (CDC) report that wearing seat belts and using child safety restraints properly can reduce the risk of death and serious injury by half. However, you should also understand Rhode Island laws and the penalties you face if you violate them. Any person 13 years of age or older, in any seating position, to wear safety belt and shoulder harness systems properly while being transported. Any vehicle operator to wear a safety belt or shoulder harness system properly while driving. Any child under the age of 8, shorter than 4’ 9”, and less than 80 pounds must be properly restrained in a rear-facing car seat safety system. Any child age 8 to 12 must be properly restrained with a seat belt, in any seat position in the vehicle. If a law enforcement finds a child riding in the front seat, or any child age 8 or older not wearing a safety restraint, you will be fined $85. If you transport a child without any child restraint, you must appear in court. 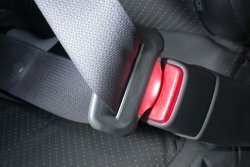 If you need help understanding Rhode Island’s seat belt laws, or you have recently been involved in a car accident, contact the attorneys at Kirshenbaum & Kirshenbaum. They can answer your questions and help you make informed decisions about your case. To get started, fill out the online contact form on our website.